International, national, and local artists gather in San Vicente to beautify the elementary school compound with murals that celebrate Ecuadorian and Manabita culture. 25 International, national and local artists collaborate with the survivors of the April 2016 earthquake to create a living outdoor gallery to aid in Canoa's physical, emotional and economic reconstruction. 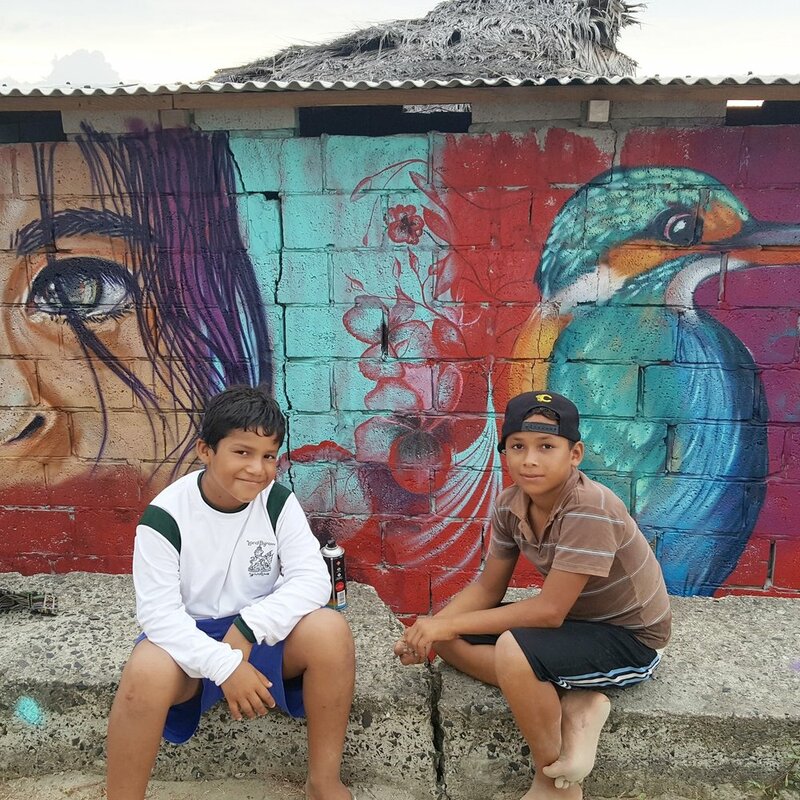 Ten artists paint over 25 murals in 7 days in the small beach village of Briceño to reactivate tourism and stimulate the local economy after the devastation caused by the earthquake. FDC partners with Indómita Festival de Arte Urbano for it's sixth edition, where International and national artists engage in an immersive cultural exchange with local artists and the Shuar indigenous community to create an outdoor mural gallery that celebrates Zamora's diverse cultures and promotes environmental awareness. Artists, community members, authorities, and organizers joined forces to create and present more than 20 large-scale murals to the community of Las Vegas and assist in the beautification of one of the most emblematic neighborhoods in the capital of Manabí. International, national, and local artists aid in the revitalization of Bahia after the 2016 earthquake and in the fight against violence against women by creating an outdoor gallery that not only beautifies the streets of Bahía, but also tells the stories of the women that live their, celebrate their contributions to society, and promote equal rights for women. FDC partners with Alégrate Canoa to offer free art workshops and youth-led mural projects year-round to local high school students as part of their school curriculum, designing and painting murals and public art projects in an effort to beautify Canoa, generate an interest in art and curb delinquency.